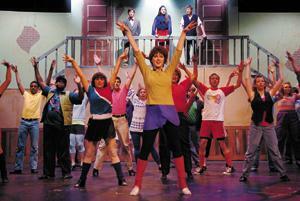 Delaware Hayes High School students rehearse late last month for their upcoming musical Fame. Delaware Hayes High School students will dance and sing in a musical favorite when they take the stage this weekend with Fame. Showtimes are 7:30 p.m. Thursday through Saturday, May 1-3, with a matinee performance at 2 p.m. May 3 at the high school. Based in the early 1980s at New York City's High School of Performing Arts, the musical follows a group of energetic teenage students as they prepare for careers as entertainers with various levels of success. Director Cherie Brooks, who also is a music teacher at Dempsey Middle School, said this year's performance is going to be grand. "Other schools put on performances," she said, "but Hayes puts on a production." Brooks said the PG-rated musical will be "big," meaning there's a large cast, lots of technology and a live band. Challenges this year include illness -- several members of the cast have had the flu -- and ever-present technical difficulties, especially with wireless microphones. Dominique DeBiasio, a junior who plays the teacher Miss Sherman, said she's enjoyed working on the musical. "Fame is a unique show considering the last show (West Side Story) was a classic," DeBiasio said. "Fame is new and we can relate to the characters because they're in high school." Kyle Kraft, a sophomore who plays musician Goodman "Goody" King, said his favorite aspect of the musical is the bond students share. "Musicals are one of the best ways to get all the grades together," Kraft said. "We're a crazy family." Also enjoying the social aspect of a musical production is freshman Blake Summers, the student director in training. Despite not being cast, Summers said he's enjoyed his new role. "I'm down on the house (in the audience section during rehearsal) so I read Ms. Brooks' notes and I'm constantly learning what she tells the actors," Summers said. When selecting a musical, Brooks said important factors to consider are the returning cast members and variety year to year in the types of productions. "Fame has a lot of dancers, which is good because our dancers are excellent," she said. "There's also a lot of solos, which work because we have so many seniors." This year also marks a milestone for Brooks. She has taught in the district for six years, which means this year's seniors are the first grade she's worked with from middle school to graduation. "As people, they have all grown into great young adults who take their work seriously, but they still have fun," she said. Auditions began in February and the 42 students started rehearsals in early March. The rehearsals usually last from 3 to 8 p.m. Monday through Thursday and from 3 to 4:30 p.m. Fridays in early March. Brooks said the cast's experience varies from none to heavy involvement in choir and different types of dance. "We have kids on all levels and we expect the best out of all of them," she said, "and they always come through."